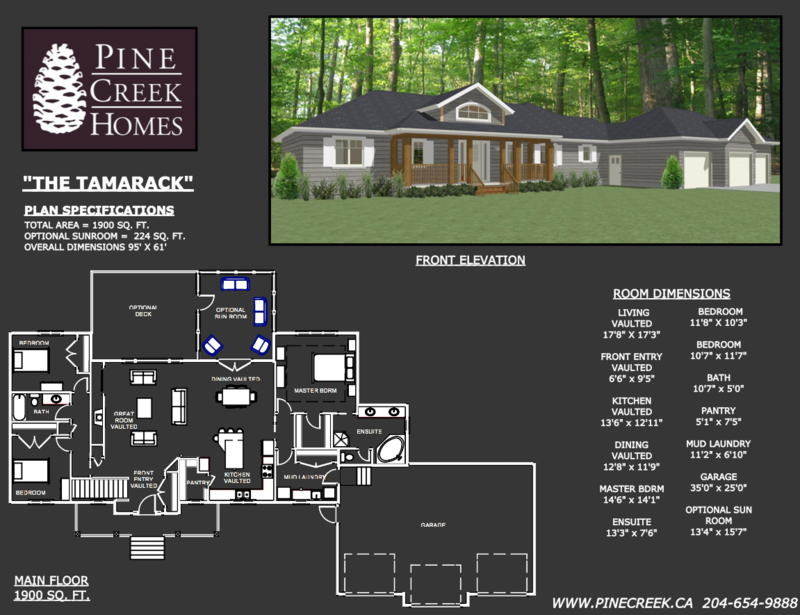 The Tamarack is a very popular design on our website, with 1,900 square feet of floor space, three bedrooms and two bathrooms. The covered entryway and front porch, with a raised dormer above, make for great curb appeal. When you walk into the entry, you immediately notice the high ceiling that leads into the 12 foot vaulted ceilings of the great room. This living area centers around a fireplace/entertainment unit that is fully customizable to suit your needs and style. The large window facing the backyard lets in lots of natural light, flooding the space with sunlight and providing views into the backyard to watch the kids play. The L-shape kitchen features a massive eat-in island, with plenty of space to serve food, entertain and eat all at the same time. Another great feature of this kitchen is the large walk-in pantry. The patio doors behind the dining area lead directly into a sunroom, which is surrounded by windows on three sides. The sunroom is situated for maximum air flow and maximum natural light both of which can be enjoyed the beautiful summer days and nights. The sunroom could easily be made into a four season room to add space to the home in the winter months when we feel like we need it the most. The master suite is seperate from the other two bedrooms for added privacy. It features a nine foot tray ceiling, a large walk-in closet and an ensuite bath that has everything you might want – dual sinks, a custom shower, a soaker tub and a seperate room for the toilet. The oversize triple garage has an extra deep center bay for longer vehicles and leads directly into a large entryway with an option for main floor laundry (shown). The space used for the main floor laundry could also be used for coat hooks and benches or an extra closet.